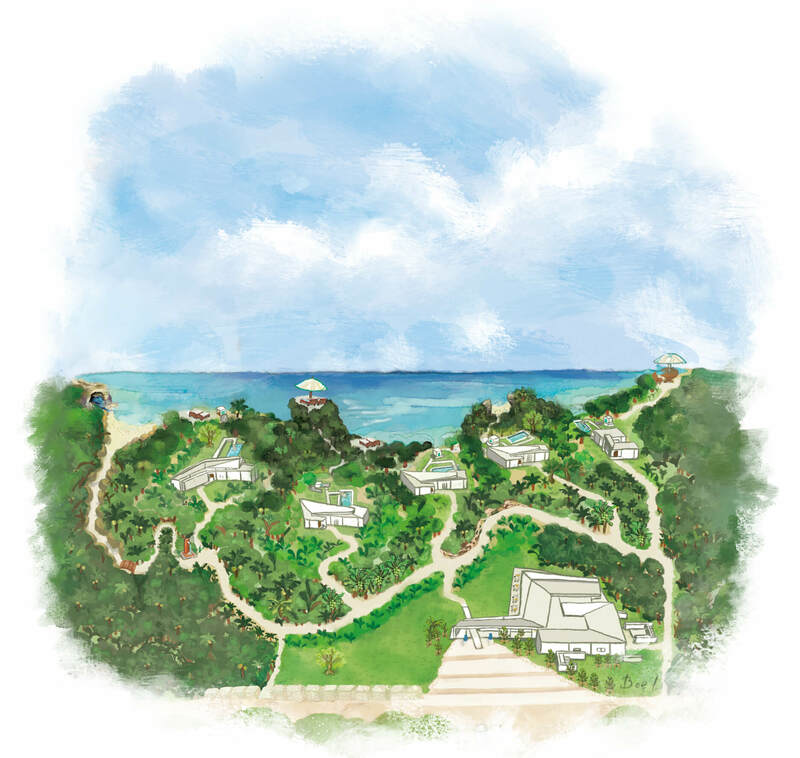 SITE GUIDE MAP | JUSANDI | There are only 5 villas in great nature of Ishigaki where you can relax from heart to soul. On the ground of JUSANDI, you will find Yaeyama flora and fauna. Island Banana and Papaya have grown naturally in the ground, as well as some kind of protected species of animal like Coenobitidate, Spilornis Cheela, Evelynae, and Ryukyu Halcyon. Additionally, you will be able to observe some coconut crabs and 9 kinds of fireflies, which it is difficult to see on the main land of Japan. Besides, the ground base of JUSANDI is Ryukyu Limestone which protruded at ancient times, so you will.discover fossils shells and corals on this site. Please enjoy walking on the pristine nature spot. Please refrain to go into the other villas. Please refrain to visit our hotel private beach during the night, because there is not an outdoor lamp at all on the path to the private beach. Our hotel guests can swim at the private beach, but please do not swim at the reef area. The tide is running strong,and it is risky in terms of swimming.